So, if I could have a chance to go to my Prom this year, I would wear something that is shown in the picture above! The first thing, I would decide on. Once I select a dress, I would select the other accessories and makeup according to it. One shouldered is one of my favorite style! The first evening dress I bought was one shouldered. Next thing I would choose. As this is a one shouldered dress, I would not wear any necklace with it! This dress has golden in it and I will definitely wear red lips with it. This is why I prefer coppery golden color rather than yellow golden for jewelries and shoes. This coppery golden accent color will bring the whole look together. I would always go with a messy up-do with this look. However, I do understand that it completely depends on your taste and style. Still, I would highly recommend summery hair-styles for prom. For ideas about different types of beautiful but simple summer up-dos and hair-styles, feel free to visit The Solemates Blog. You will also find different other occasions, such as wedding, outdoor events etc. related helpful ideas and tips on their website. 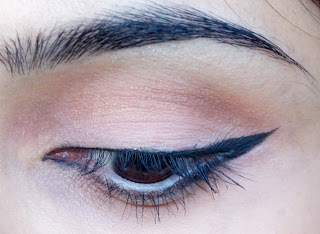 Winged eye with natural looking eye-shadows. For tutorial click here. Bright red lips. For tutorial click here. Considering the latest nail-art craze, I must go with a nail-art that consists of black-gold and red color. Above picture describes what I have come up with. For tutorial click here and for photos click here. Hope you enjoyed this look. Please share what would you wear on your prom day. Great tips! Love the clutch! Hey diva..♥ red lips and messy bun..well inspiring post. Joined you via GFC name Modonika, would love to see you back on mine. What about follow each other here and on facebook? Love the nail art here! Thanks for your tips on how to wear on our prom. In this makeup tips accessories play a vital role.